Russell Blake » Stephen England Does JET Kindle Worlds! 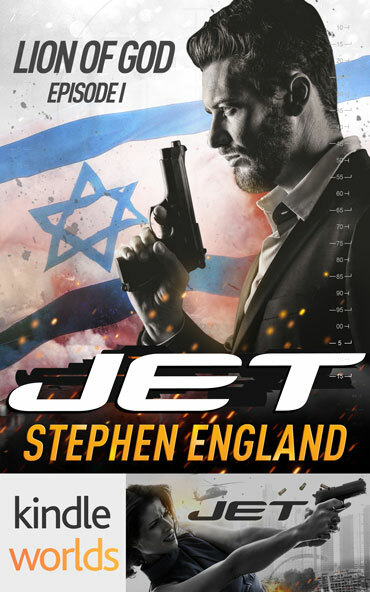 Stephen England Does JET Kindle Worlds! Russell: How did you come to be interested in the JET Series Kindle World? Stephen: Well, you see it all started with this crazy author I met on Facebook, and his endless stream of “Dear Diary” posts. . .nah, all kidding aside—my introduction to your work came through the El Rey novels. After hearing about the upcoming launch of the Kindle World, I began delving into the JET novels and became acquainted with her story. Russell: Tell us how your story links to the JET Series. Characters, setting, specific event? The novella finds Ariel as the leader of a small Kidon assassination team in October of 2000, as the Second Intifada explodes upon the scene and a pair of Israeli reservists are lynched by a mob in Ramallah. . .a real-life historical tragedy which sets the stage for everything that is to come, as Mossad Director Efraim Halevy authorizes the Kidon to track down and kill the man responsible—a journey that will take Ariel from the heights of the Golan to the arrondissements of Marseille, to the Tuscan island of Elba. Russell: Is there any crossover or meetings between your characters and any of the original characters? Stephen: Lion of God takes place well over a decade before the events of my first novel, Pandora’s Grave, but fans of my Shadow Warriors series will immediately recognize several characters—most notably the Mossad’s Avi ben Shoham, who serves as Ariel’s control for the operation. And David Lay, who is almost at the end of his tenure as CIA Station Chief Tel Aviv. Lion of God supplies details from both men’s pasts that haven’t been seen anywhere else, and their at-times contentious professional relationship provides ongoing drama. There’s even a very brief (Blink and you’ll miss it) cameo from my Shadow Warriors protagonist, CIA paramilitary operations officer Harry Nichols. Russell: The JET series has been set all over the world… the Middle East, Asia, South American, the Caribbean, etc. Tell us about where you set your story, and why? Stephen: The action of Lion of God begins in the Negev, shifting quickly to the streets of Ramallah and the Gaza Strip as the events of October 12th, 2000 unfold around you. You’ll look down on Tel Aviv from the heights of the Matkal Tower, the bastion of the IDF’s General Staff—and stride into Yasser Arafat’s compound alongside CIA Director George Tenet. From there, the story jaunts around the Mediterranean—from the marina of Marseille to the rocky cliffs of Elba. Russell: Did you decide to include any other characters from JET besides that of Ariel? Stephen: Yes. Readers of the first JET novel will remember Eli Cohen, the Mossad bureaucrat who sold out Jet’s team. Well. . .he wasn’t always a villain, and Lion of God delves into the story of the man he once was. Russell: What major theme comes across the clearest in your story? Is this a theme found consistently in your other works? Please market those works here! Stephen: The thing I strive hardest to portray in my writing, both with Lion of God and my own Shadow Warriors series (Which has now grown to encompass five volumes: LODESTONE, NIGHTSHADE, Pandora’s Grave, Day of Reckoning, and TALISMAN) is the raw humanity of men and women at war, forced to make impossible choices in the face of overwhelming odds, in a world where alliances are uncertain and nothing is as it seems. Russell: Were there any unique challenges you found in the writing of Lion of God: Episode I? Stephen: Several. There was, of course, the distinct difference in writing about and working to flesh out a character created by another author. But principally, the most challenging proposition was the historical setting and the realities that presented —weaving fictional JET and Shadow Warriors characters into scenes with real-life individuals such as Yasser Arafat and George Tenet. Playing “what if” and trying to imagine (based off extensive research into bios, recorded speeches, and available transcripts) what such men might have said behind closed doors as the world came down around them. Russell: You’ve called this story “Episode I.” Can we expect more from Lion of God? Stephen: Yes, indeed. As readers will find as they finish the first episode, this story has just begun to unfold—with an ending plot twist that will take your breath away. Work on the second “episode” has already begun—and I am hoping, story permitting, for a trilogy. Russell: Share some of your story about becoming a writer. Stephen: Writing has simply always been a passion of mine, the beauty of losing yourself in a world of your own creation. Of drawing readers in to experience it with you—it’s a feeling like no other. I’ve been at work on the Shadow Warriors series for over a decade and creating that universe is the continual unfolding of a dream. I’m thrilled for all the people who have chosen to share it with me. Russell: Do you have a background related to your writing? Interests? What makes you interesting outside of your books? Stephen: That’s not what I understand from Dear Diary. . .ha, not really. I’ve simply been a student of military history ever since I was a kid. And, of course, thus espionage. . .for by way of deception, thou shalt make war. It’s been my unique honor along this journey to meet more than a few members of the American special operations and intelligence communities. Amazing individuals. Russell: JET is set in a world where many governments including Israel and the U.S. have covert operations including false flag and assassinations. Do you believe this is really the world we live in? If so, what are your thoughts on the future? Stephen: To an extent. In real life, such operations are far harder to execute than they are made to appear in fiction, whether on the page or the screen—and the old Scotsman’s proverb is always in effect, “Three can keep a secret, if two of them are dead.” That being said, there are certainly such operations going on—I recommend Anthony Cave Brown’s massive tome Bodyguard of Lies on deception operations during the Second World War for those who want to imagine what could be taking place event today. That being said, I think the more serious concern in reality is what gets to the core of actual intelligence work. . .control of information itself. Russia in particular has taken to the Internet like a fish to water, threatening to turn the Information Age into the age of dezinformatsiya—disinformation. I would say that hardly a day goes by that I don’t encounter some evidence of Kremlin influence ops on the Internet—whether it comes through official channels like RT, conspiracy sites, or the Snowden operation itself. Russell: What are you working on next, aside from the next Lion of God novella in the JET Series Kindle World? Stephen: I’m currently nearing the close of the next volume of the Shadow Warriors series, Embrace the Fire. Set in the UK, the story finds Harry Nichols caught up in the middle of steadily growing unrest as the nationalist far-right and Islamist forces come to blows, with tens of thousands of innocents caught in the cross-fire. His career with the CIA is over. . .his war has only just begun.